At Kiser Elementary, we are on a quest for excellence. This means our teachers and staff members work together to provide an optimal educational experience for every student. We encourage our students to work hard, to act responsibly, and to respect one another. Our commitment to the growth and well-being of our students shows in everything we do, and we savor the opportunity to offer enriching educational experiences that promote discovery. Nothing satisfies us more than helping our students gain a love of learning and the confidence to succeed. We have a solid discipline plan, and we strive to keep parents informed of student behavior on a regular basis. Through our Project Wisdom program, we encourage the development of positive character traits with thought-provoking morning messages that highlight qualities such as integrity, respect, and kindness. We also teach lessons on drug and alcohol prevention in every grade. At Kiser Elementary School, we provide appropriate skill development in all academic areas. Our goal is to have children reading at grade level by the end of third grade. Through monitoring, we will fill in the learning gaps by “breaking the codes” in reading, language, and math. We strive for excellence, empowerment, and engagement of both students and staff. The Theba school board honored William Henry Kiser in June of 1976 by naming Kiser Elementary School after the head teacher who had been with the school for 28 years. William Henry Kiser came to Arizona in 1947, hoping against hope that the dry Arizona climate would cause his asthma to abate, but fearful that he would not live long enough even to fulfill a nine-month teaching contract and begin the educational career that meant so much to him. Twenty-nine years later when he retired as principal of Theba School, the school was named after him, an honor that he believed to be the highlight of his life. Henry took his first teaching job on the Papago Reservation near Sells, after he and his wife, Pearl, with their ten- and four-year-old sons in tow, moved from Cincinnati, Ohio. The family lived in the tiny, remote village of Vaya Chin. A year later they moved to Gila Bend, and Henry began teaching at Theba School, which primarily educated the children of workers at what was then the sprawling Gillespie Ranch, 10 miles west of Gila Bend. 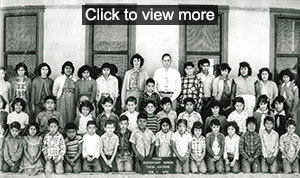 At that time, Theba School was a two-room adobe building, with a room in back for living space. By his retirement, it was a more modern four-room building, but even that didn’t compare to the design, space and flexibility of the newly constructed Kiser Elementary School. Henry, who was only the second teacher at Theba School, loved working with the students, and he delighted in their progress. Pearl, also instrumental in the education of the students, worked with him in the school office for about 17 years. Many of the students came to consider Henry and Pearl as part of their family. “It was more so like a home than a learning factory.” - Tracy Dent, student. ”Mr. and Mrs. Kiser . . . thank you for being the special people that you are." - Nellie Bemal, student. “I know the people of Theba will miss you both in the years to come.” - Fernando Cruz, student. “I felt that you were instrumental in my career as an educator. I hope that some day I too will have students who remember me a few years after.” - Armida Gonzalez, student who went on to be a bilingual coordinator for another school district. “Your kindness and interest in people you associate with works like a miracle. . . You both have been a rare example of true leadership, working together as a team for the benefit of Theba School and community." - Katherine Radetich Baron, teacher at Theba School from 1961 to 1963. Henry and Pearl had three children, Don, Jim, and Cara, all of whom live in Arizona. Henry died in 1982, and Pearl died in 1988. To prepare students for college, career, and community involvement through a rigorous academic program and meaningful character education. 7:50 a.m. – 1:00 p.m.